I am using hardy on my laptop. If I keep it running for a day or two networkmanager takes close to 1GB of memory which I find wierd. here is the output of my lspci. please attach your complete /var/log/syslog (taken when your network-manager process has been grown to ~1GB9. I can confirm the bug.I have the same wireless card (intel 3945). I can see clearly the amount of ram used by networkmanager growing steadily, about 80-100K every 30 seconds. Needless to say after one night, the amount of ram is a lot. It was using over 300 megs earlier today. Attached is my syslog. I agree ! This is a VERY big issue. Here, I have 2 laptops : my old one, a core duo Macbook running Debian sid (1.25Go of RAM) and my brand new Dell XPS M1530 (4Go of RAM). On the end of the day, on the Macbook, NetworkManager eats nearly all the RAM. On the end of the day, on the Dell XPS, NetworkManager eats 9.2% of the RAM, which result to 377Mo approx. This means that the bug is not linked to Ubuntu, but more a global NetworkManager issue. Please note that I don't switch networks during this period : I stay on my WLAN using WPA2. Please note that #214593 seems to be a duplicate of this bug. Same thing here with the iwl3945 driver. After 3 days of uptime, NetworkManager uses 450MB of RAM on my system. Observed here too, in a Toshiba U200 laptop recently updated to Kubuntu Hardy. Didn't happened in Gutsy. I had suspended once a few minutes before sending this, but I have observed this without suspending or hibernating. I can confirm this bug. 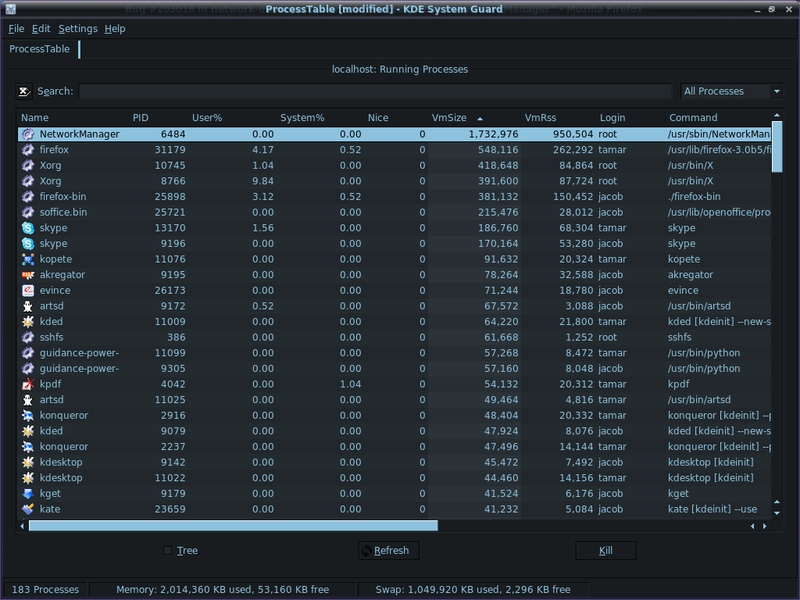 It uses 368 MB after 4 days uptime with a couple suspend/resumes. Why are you all posting syslogs ? Don't you understand that here you have a *memory leak* which is generally a lack of some free()'s on some pointers ? Btw, it's seems to be an upstream bug, not a bug in Ubuntu. I *really* don't think that posting a syslog message will help. The second poster (who at least I presumed is some dev) requested them. I valgrind'ed it and it show some significant leaking, too. Confirmed on my Inspiron 1300, WPA2, using an external USB adapter (not sure which chipset or drivers it's using). Computer has been on for over a week, no suspend or resume. NetworkManager is now consuming 1,736,628MB virtual memory. i would like to confirm the issue as well. my system is up for 4 days, NetworkManager uses about 320MBytes om memory. Bus 003 Device 005: ID 04d9:1400 Holtek Semiconductor, Inc.
i don't attach syslog file, because mine is simmilar to the one posted above. This bug is more than three months old now. Does anyone know if something is being done about it? Is there a hotfix? Could someone *please* try to make a patch so we can get out new packages? if left to run for an extended period of time with many access points available. The size of the leak in this case will scale linearly depending on the number of access points. fix by robert applied to development release branch. thanks to bendis <email address hidden> for finding this glitch. That seems to fix the problem for me in hardy as well. The package installs just fine. When an insignificant system daemon leaks 1gb of memory per day, it can have a significant impact on system performance and stability, and IMO it is not exactly "low" priority. When can we expect to see this fix released to updates? I also have the same problem. 409 MiB after ~4 days uptime. I only have 512 MiB physical memory, and it really started to become a problem. Glad to see the status is fixed in Ibex. Will it be backported to Hardy? I co-sign. We should get this into hardy quickly, as it's an old(since gutsy I believe) and very serious memory leak that almost every desktop user seems to experience and the fix available, tested and working. Alexander, Robert could you please do something about it? Thanks! I wrote a little Perl script which beeps and uses libnotify to show you when the leak is occurring (attached, argument is number of seconds between checks). I get a leak of about 4kb every 5 seconds, although there are periods of 20 seconds about once a minute where I get no leak. It seems like the leak only happens when knetworkmanager is running. When I close knetworkmanager, the leak stops. > It seems like the leak only happens when knetworkmanager is running. When I close knetworkmanager, the leak stops. As you can see from the patch above, the fault lies in part of the code that deals with communication between NM and other processes via DBus. This completely swamps my macbook running hardy after about 5 hours (I'm in NY with a lot of access points around). I'll try connecting then shutting down knetworkmanager and see if that helps. I've seen it get as big as 500M resident, and >2G virtual! If I wait too long before rebooting or killing it, everything locks up and I have to force shutdown/reboot. Would be great to see that fix get applied to Hardy, what does the "Triaged" state mean? Is that purgatory, or is the fix in queue? Please release the fix for Hardy. This is a real nuisance. Pppplllllllleeeeeeeaaaaaaaaaaaaaaassssssssssssssssssssseeeeeeeeeeeeeeeeeeeeeeeeeeeee. I had no problems with it so far! It uses less memory and I reached all wireless lan's with it without problems! I have posted an easy quickfix: Just manually download and install the fixed packages as described here http://linux-tipps.blogspot.com/2008/06/memory-leak-in-ubuntus-networkmanager.html. A link to the amd64 package is included. It would be nice if someone could post a link to the 32-bit package as well. Maybe it's possible to upload it here? I've found a 32-bit package as well and there are permanent links available on the post now (via rapidshare). I can confirm the bug and that the patch fixes the problem. why is the fix for the memory leak not backported to hardy? it is a major issue when the machine is eaten up and a show stopper! please update the hardy package soon! The maintainers *really* don't seem to care. We're pushing for it for months now. It's probably fixed in the next 8.10, but of course this is ridiculous. Of course this qualifies as a bug fix for stable releases. Please blog about this bug or notify a Linux news page! You can manually download and install the package version that fixes the problem. There is absolutely no need to backport a patch, etc. *all* that is necessary is to release the already available packages (version 0.6.6-0ubuntu7+) for hardy. Nothing else. They work fine and fix the issue, the libraries are compatible. They only need to be put into the right directory. I confirm this Bug on Intrepid Final Release 64bit. I have got 3,7GB RAM and 2GB Swap. In less than 1 hour Networkmanager fills the memory and freezes the computer. Only reset helps. I shipped around it using wicd. I used the wired gigabit ethernet, when the problem occured. Such a big issue is not fixed after three months? It's a lot more than three months. The problem exists since 7.10. @Alexander Sack do you know how to get the bugfix you applied 5 months ago released for Hardy? If you are not responsible then who is? I noticed the same bug. I'm running an up-to-date kubuntu 8.04 on the eee 901 (array.org's kernel). I can confirm this serious bug is still occurring on up-to-date Intrepid as of 2008-12-09. Pentium 3.0Ghz hyperthreading 1GB RAM, 1.5GB swap, using wired but have wireless adaptor installed as well. I was using Ubuntu 8.04 successfully. Did an upgrade to 8.10, and had this runaway NetworkManager problem. Since there were other issues related to a problematic upgrade, wiped hdd and installed a clean 8.10, which fixed the other issues but the NetworkManager problem reoccurred. NetworkManager About dialog reports version 0.7. Upon bootup NetworkManager process starts consuming memory, confirmed in System Monitor. Within 15-60 minutes it has consumed 600-800MB slowing the system to a crawl and eventually Ubuntu stops responding. Executing "sudo killall NetworkManager" before this point clears the consumed memory and returns the system to a stable ~200MB memory. Executing "sudo NetworkManager" causes the runaway memory problem to begin again. Below is some output of /var/log/syslog when the NetworkManager process is running. this specific issue was applied). -- how can you be sure it's not? network-manager is leaking memory for over a year now. We could start installing scripts that automatically track its memory usage and report leaks. What about a generic "network-manager leaks memory" bug? Then people can list all their different situations in separate bug reports. I definitely understand the frustration this causes. How sad, though. Usually the open source process works pretty well... So anyone pulling his hair out over these annoying memory leaks: rest assured, this is an exception. committed fix for 0.6.6 to hardy branch (rev 120); see related branches section of this bug for details. setting intrepid target to fix released again. The code has changed considerably and shouldnt be applicable. > -- how can you be sure it's not? > network-manager is leaking memory for over a year now. We could start installing scripts that automatically track its memory usage and report leaks. > What about a generic "network-manager leaks memory" bug? > Then people can list all their different situations in separate bug reports. > I definitely understand the frustration this causes. > assured, this is an exception. now. Please help testing that package. Sorry, I thought the branching mechanism at the top meant the issue could be tracked in multiple branches. I will move my comment and further discussion to #291074 which seems to be the Intrepid gathering place for this issue. Kind regards. > place for this issue. Kind regards. -proposed archive (instructions should be above). ping ... anyone can confirm that the hardy-proposed package doesnt have the memory leak and still is as stable as before! > the memory leak and still is as stable as before! confirm that it's working perfectly, too. I am using intrepid and seems NetworkManager is no longer leaking. I have proposed and backport both enabled in my system. > have proposed and backport both enabled in my system. If there is a memory leak remaining it's definitely not as bad as it was. I was severely affected by the leak and it seems to have been resolved. Guess we are ready to push this to -updates then ... thanks! I've taken it from -updates and it seems to work correctly now.